Nominations have closed for the 2019 Australia Day Awards. Awards will be delivered in 7 categories at the Region’s Australia Day celebrations will be held in Gulgong at Anzac Park on Saturday 26 January. Mid-Western Regional Council Mayor Des Kennedy is calling on residents to put forward nominations for the 2019 Australia Day Awards. “The award categories have been reviewed and there are now 7 categories to nominate someone who has made a difference in our community and deserves recognition for their achievements and contributions,” Cr Kennedy said. 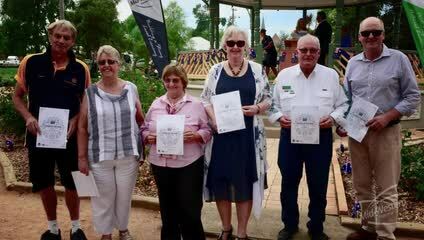 Cr Kennedy said contributions come in all forms, with the 2018 Mid-Western Region Citizen of the Year, Carolyn Peek recognised for her service of others, especially those with an intellectual disability. “There is a category to suit all achievements from sports to the arts and community,” Cr Kennedy said. Outstanding achievements, contributions towards the community, sporting achievements and a strong support of community values are the basis of the 2019 Mid-Western Regional Council Australia Day Awards. Nominees must be Australian citizens and must reside within the Mid-Western Regional Council area. Nominations close on 26 November 2018. Mid-Western Regional Council’s Australia Day Celebrations will take place at Anzac Park, Gulgong Saturday, 26 January 2019. Information about each of the categories and nomination forms are available on Council’s website. Who can be nominated for Citizen of the Year? Who can be nominated for Young Citizen of the Year? What is the eligibility criteria from Community Event of the Year? Who can be nominated for the Glen Johnston Memorial Award – Arts & Music?